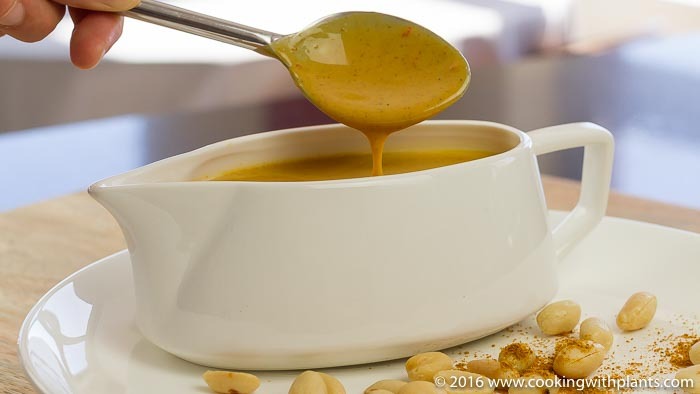 Today I show you how to make a curry satay sauce that requires no cooking and uses only 3 simple ingredients. Put on rice, potatoes, beans, vegetables or salad… or use as a dip for tofu skewers and much more. This is perfect to make a quick vegan meal on the go! Place everything except water in a small bowl and mix ingredients together until well combined and smooth. Add water as needed to get the sauce to a consistency that you want. Leave it thicker for a dip or use more water for a pouring sauce. I’ve made this recipe a couple of times, and I love it. Thanks for all of your recipes and videos! I made this recipe the other day with almond-butter and it turned out wonderful! I ended up making some oven baked eggrolls and used the Curry Satay Sauce it made my eggrolls taste like Thai food! So yummy! Today I used the leftovers of this sauce on a hot dish and it was over the top amazing! I chopped up a baked potato and tossed it into a pan with some Coconut oil spray & minced onion. Then I added some baby spinach and tossed it in the pan for about a minute or two. Added a salt and pepper to taste and the Curry Satay Sauce you created. It was so great I’m making it again tonight and this weekend. Thank you for sharing your wonderful healthy recipes! Anja, thank you for this great sauce and Rachel, that sounds like a great dish. Thank you ladies!